We know you're in a hurry! To make it easier for you, we've put together the shortest route to navigate your way around Zoho Books. Before we get into the specifics, see where you'll find what. 1. 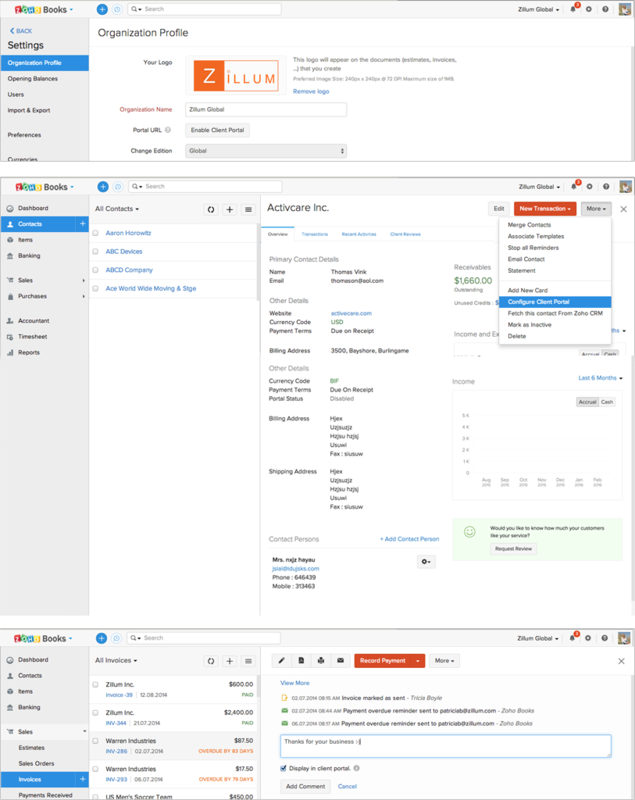 The Navigation Panel on the left-hand side lists all the modules of Zoho Books. 2. 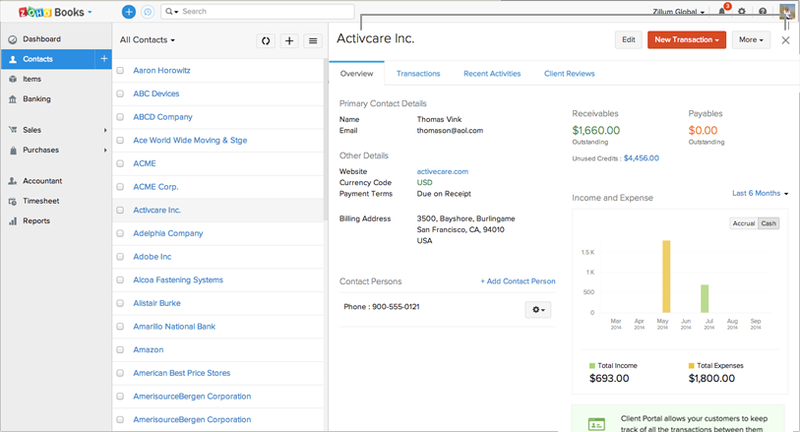 Get into the Sales tab and the Purchases tab to manage Estimates, Invoices, Expenses, Bills, and more. 3. The Quick Create button by the respective modules is the shortcut to create new transactions. 4. 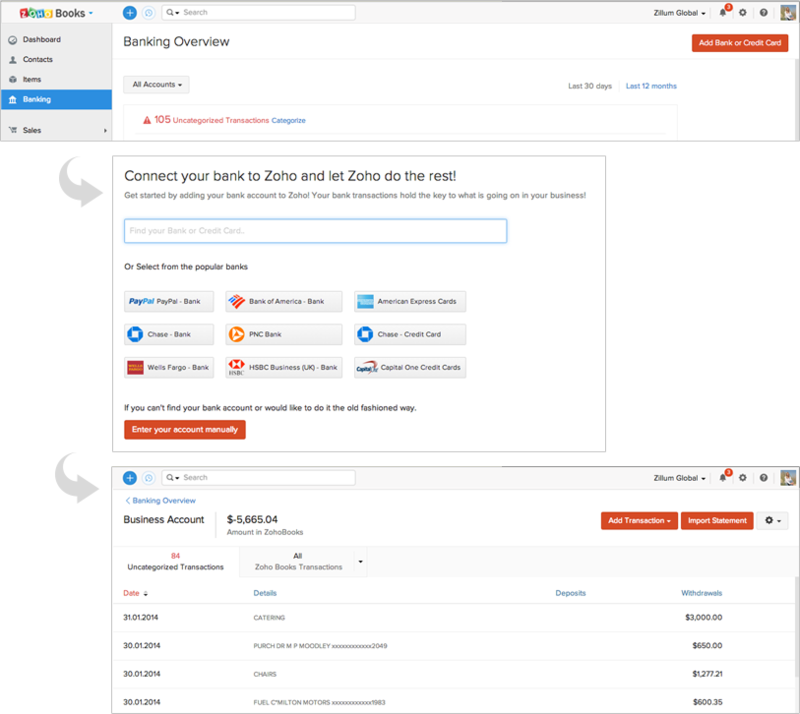 The Quick Create option can be used to create a transaction on the fly from anywhere in Zoho Books. 5. Clicking on the Recent Activities option will display of list of most recent transactions you have carried out in your organization. 6. 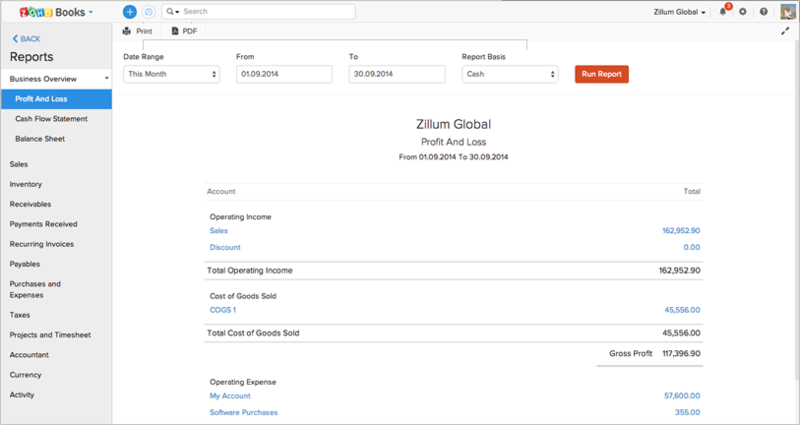 Use the Search bar to quickly find a specific transaction, contact, item or more. 7. The Notifications Section will notify you of any customer activity on the client portal as well as announcements from the Zoho Books team. 8. Click on the Settings icon to manage your Organization Profile, Users, Subscriptions and more. 9. Drill further in Zoho Books using help and Webinars or contact support from the Help section. 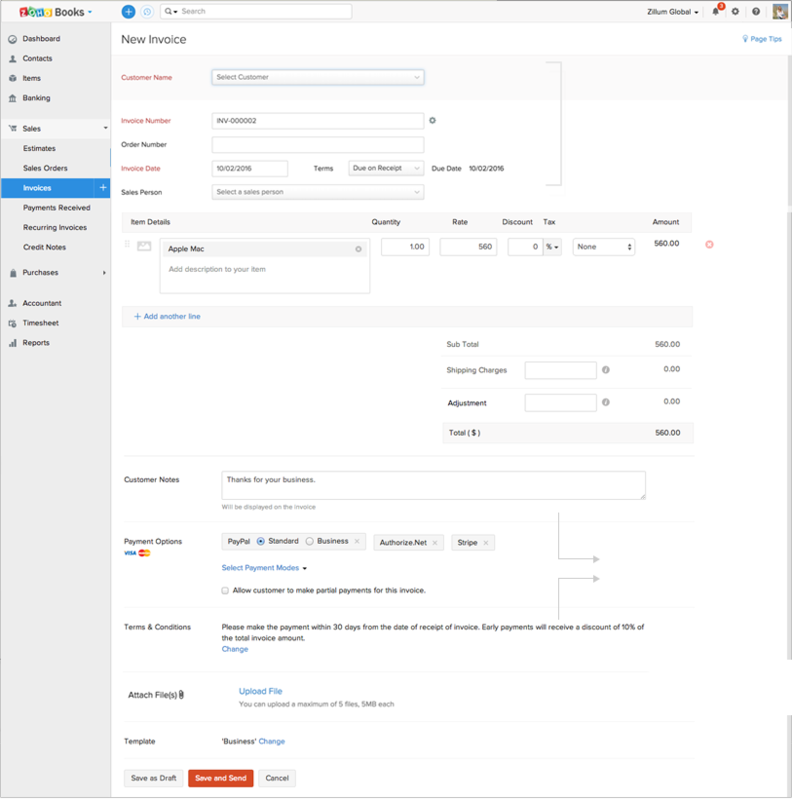 You can do the preliminary customization through the Invoice Preferences. 1. 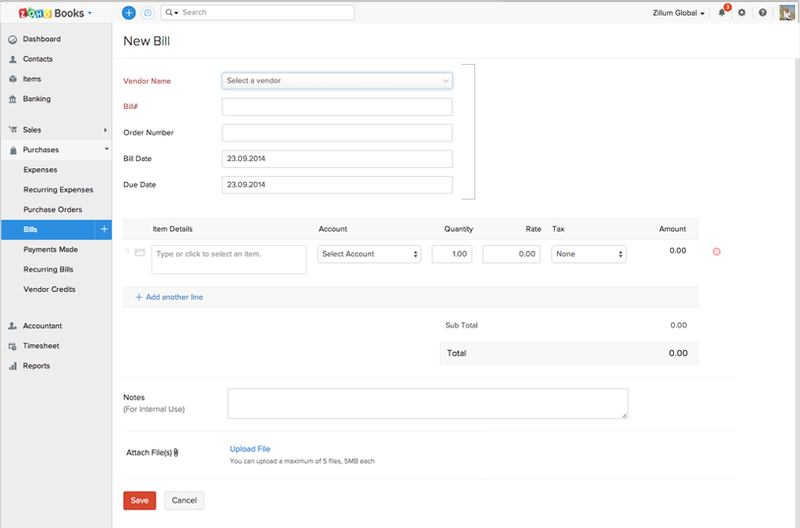 Click the Quick Create icon from the Invoices module (under Sales tab). 2. Choose your preferred Discount from the options. 3. Select additional charges like Shipping Address and Adjustments. 4. Choose your Tax Preferences for items while creating sales transactions. 5. Add a field for the Sales Person if you wish to include it in the invoice. 6. Click on Save & Continue. You can get into Settings section to add Invoice Logo, Tax, Discount, Invoice Template, Online Payment Option and more. 2. 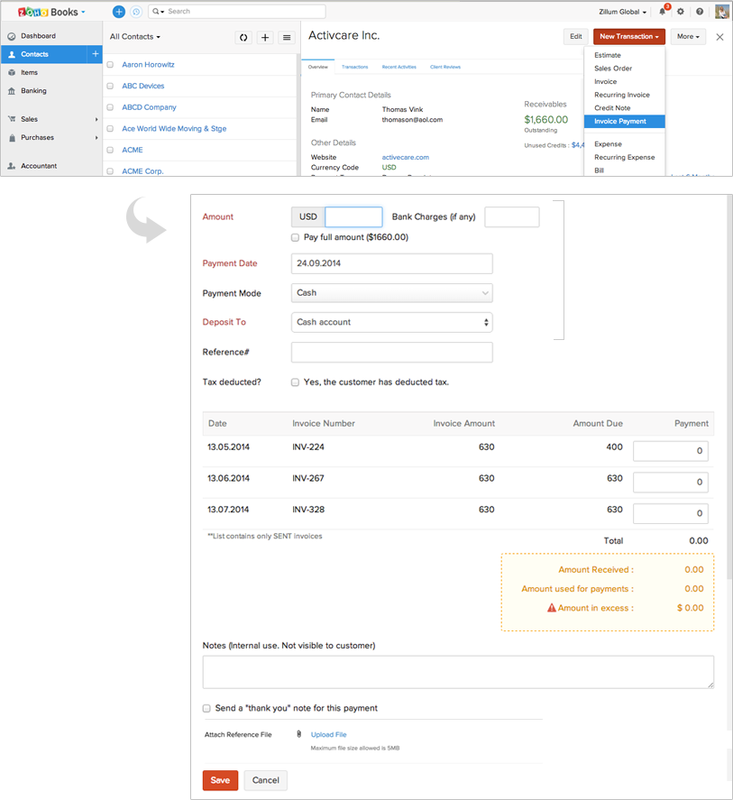 Fill the invoice fields in the New Invoice page. 3. Add or Select the Item(s) that you wish to invoice your clients. 5.Attach Files such as images or documents to your invoices and send it to your customers. 6. Click on Save and Send button. 1. The From field will have your organization's email address. 2. The Send To email address will be your customer's email address. 3. 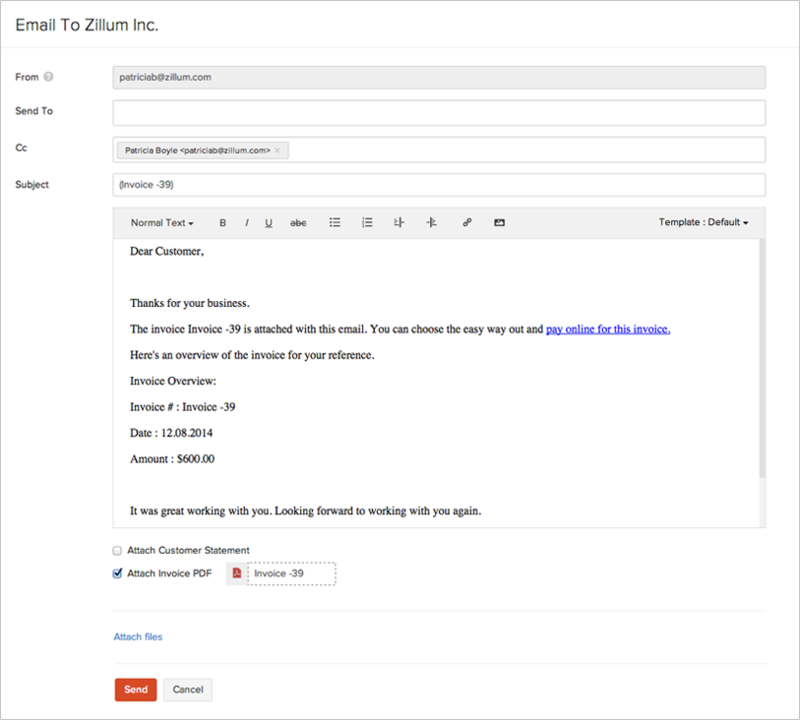 Email content will give an overview of the invoice. 4. If you wish, you can attach the Customer Statement and change the name of the Invoice PDF attachment. 5. Attach Files along with the invoice (File Size is up to 11MB). 6. Click on Send button to email the invoice. You can get into Email Templates section under Settings to customize the email Subject and Email content. 1. Click the Record Payment button from the invoice details page. 2. Enter the Amount Received from the customer. 3. Update payment details such as Payment Date, Payment Mode and Deposit To account. 4. Use the Reference# field and Notes fields to enter the payment information. 5. Attach Files such as images or documents to your payment receipts. 6. Enable the option to send a Payment Thank You email to the customer. 7. Click on Record Payment button. If you deduct the tax at the source, then you can withhold the tax by enabling the Tax Deducted option. 1. Get into the Contacts tab and choose a contact from the list. 2. Click on New Transaction button. 3. Select Invoice Payment from the drop-down list. 4. Enter the payment details such as Amount, Payment Date, Payment Mode and Deposit To account. 6. Enable the option to send a Payment Thank You message to the customer. 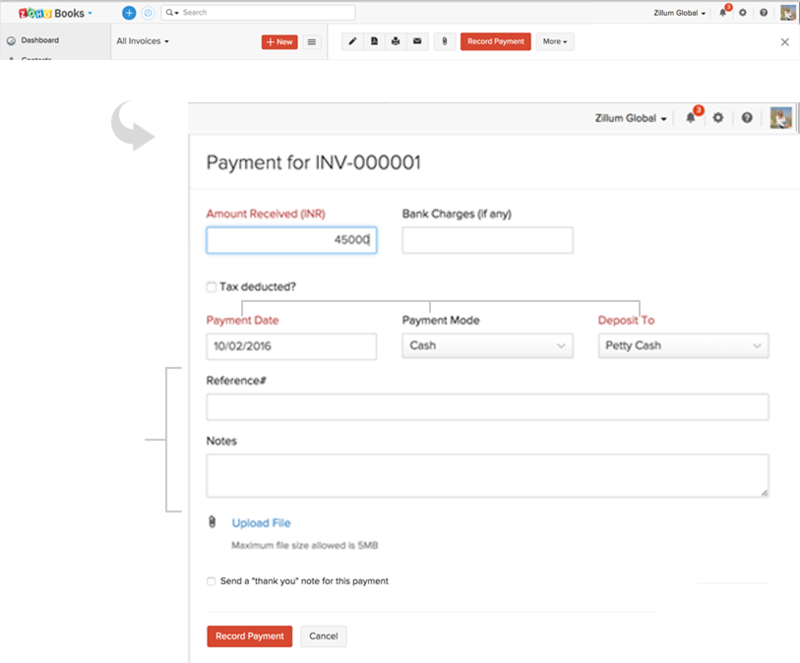 You can post advance payment and bulk invoice payments through this screen. 1. Click the Quick Create icon from the Expenses module (under "Purchases" tab). 2. 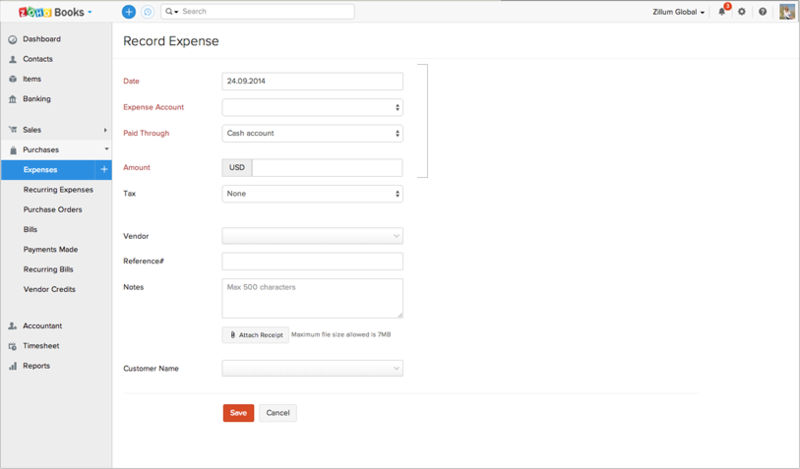 Enter the expense details such as Date, Expense Account, Paid Through account and Amount. 3. Attach Expense Receipt (Maximum file size allowed is 7MB). You can create billable expense by selecting the customer and marking it as Billable. The billable expenses can be converted into an invoice(s) for Reimbursement purpose. 1. Click the Quick Create icon from the Bills module (under " Purchases" tab). 2. Enter the fields such as Vendor Name, Bill#, Bill Date, etc.,. 4. Attach Files such as images or documents to your bills for your reference. You can add the Notes for your internal purpose. 1. Click the Quick Create icon from the Contacts module to add new clients. 2. Filter the contacts and vendors by clicking the "All Contacts" drop-down field. 3. You can Sort the contacts and import the contacts by clicking on the options menu. 4. Click on the contact from the list-view to see the contact details. 5. The contact details section displays the transactions and gives an overview of a specific contact. 6. You can Add Contact Person from under a contact. 7. Click on Edit button to edit an existing contact. 8. The New Transaction button lets you create a sales or a purchase entry for the selected contact. 9. Click on More button to perform special actions. You can choose the "Contact Type" (Customer/Vendor/Both) by getting into the contact create or edit page. 1. Click the Timesheet module from the navigation panel. 2. 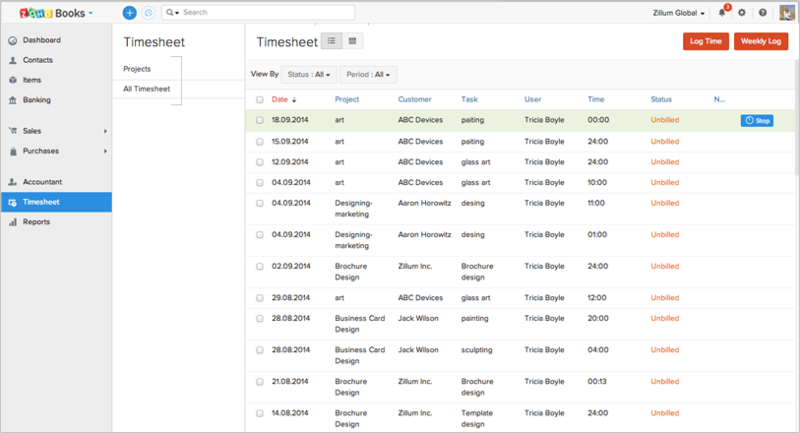 From the list-view, you can choose between Projects and Timesheets. 3. From the respective views, you can Create Projects and Log Time entries. 4. Choose between List View and Calendar View for the logged timesheets. 5. Perform the Bulk Action to delete the unbilled timesheet entries. You can add staffs and tasks by getting into the Projects section. 1. Click the Banking module to add and manage your banks and credit cards. 2. Add Bank or Credit Card button lets you connect your bank with Zoho Books. 3. Use the Search Bar to search for your bank or credit card. 4. If your bank isn't listed for automatic feeds, you can Enter your account manually. 5. You can categorize the transactions from the Uncategorized Transactions view. 6. If the bank is manually added, you can Import Statements. Owner Drawings, Owner's Contribution, etc.,. 1. Click the Reports module from the navigation panel. 2. Select a report from the left pane. 3. You can choose your preferred Date Range. 4. Click on Run Report button. 5. Print or export the report as PDF. Connect with your staffs, colleagues and accountants. 1. Click on Users from under the Settings icon. 2. Invite User button allows you to add more people to your Zoho Books account. 3. Enter the user's Name, Email address and select a user Role. 4. Click on Send button. 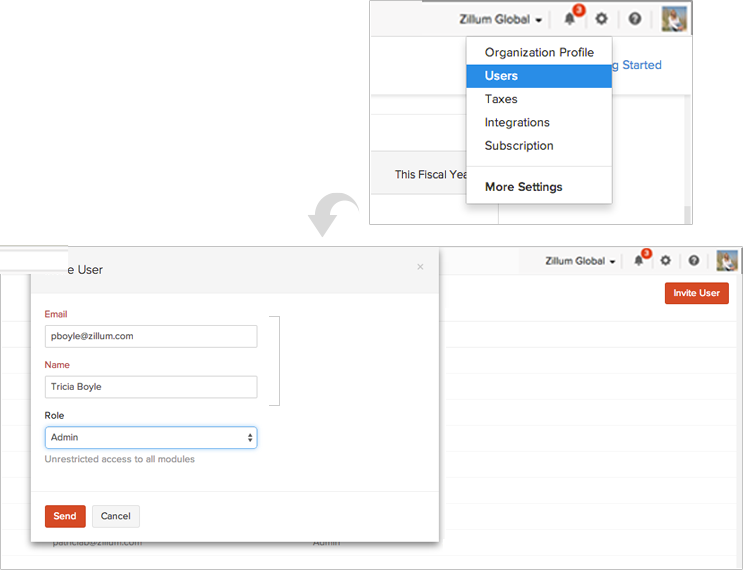 Zoho Books allows you to add multiple users to your account. 1. Enable the Client Portal from the Organization Profile settings. 2. Click the Settings icon from the Contact Details section and Configure Client Portal. 3. Get Feedback from your customers by requesting them to rate your products and services. 4. Add Comments from under the transaction history section and select Display in client portal. Your clients can view your comments in the portal, and they can reply back to you through the Comments section. 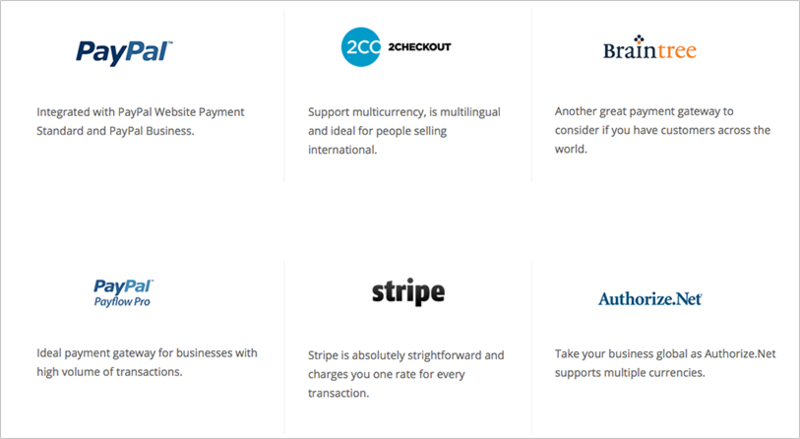 You can configure the online payment gateways in Zoho Books and can get paid from your clients faster and easier. For more information, visit this link. Manage your invoices, quotes, track payments and upload expense receipts right from your phone at anytime, anywhere. For more information, visit this link.